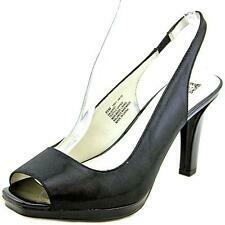 These are Anne Klein slingback peep toe high heels. with a floral design in black snake skin print. Size 5.5 M. They are in very good condition with light scuffing. See pictures. Slingback with Bow. 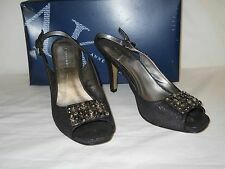 Anne Klein Gray/Pewter Peep Toe. Great for Special Occasions or Casual Wear! In Great Condition, Like new! Like new condition...perfect for Holiday parties! BLACK SOFT FABRIC UPPER. NEW WITHOUT BOX, EXCELLENT, NEVER WORN, LEATHER SOLES. 2-PEARL EMBELLISHED AT UPPER AND BOW. Classic slingback. covered heels. Condition: Gently used. In excellent condition. Clean inside and out. Height: 3.0”. Width: approx 3.1”. Size: 7 M 4" Heel. Length: 9.5". Designer: Anne Klein. Color: Black, gold. Content: Man-made materials. Insole: 10 1/2". Whatever you see in the pictures is included. They have anti-skid on the soles. Black Satin upper. Toe style is a squared off point. Pull on Elasticized strap. Rounded off pointy toe. Color is Beige. Genuine leather upper. Designer/Label: Anne Klein. Heel: 3 3/8". Material: Leather. Color: Black. 100% Authentic Or Your Money Double Back. Color BLack. New With Original Box. Anne Klein “Emani” is a Beautiful Slingback, has a 3.5” Heel. And the Anne Klein Signature Here and There. with ½” Platform Height, and Open Toe. Shoes are Black with a Touch of Peach in the Off-White Dots. Pair of Anne Klein black leather open toe sling back sandals. Designer: Anne Klein. Content: Man made. Color: Black. Heel: 3 1/4". Heels 3 1/2 ". Signature Lion face AK logo on gold tone hardware.